I panicked for a moment when we pulled out the boxes because the Mac Jr was hidden beneath the napkins. Now that I know it comes wrapped and not in a box, I won’t immediately assume it was forgotten. Panic aside, the similar design on all the packaging was really a nice touch. We don’t eat at McDonald’s very often, so I’m not sure if everything there has this same design, or if it’s just these three that match. After opening up everything, it’s clear that boxes are needed for the Big Mac and Grand Mac for structural support. 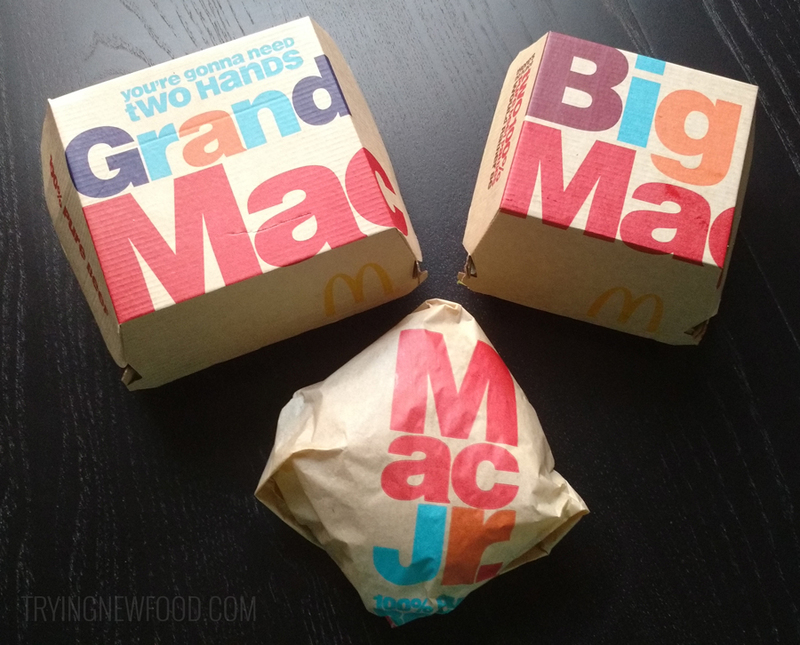 The Grand Mac even had a small wrapper within the box holding it all together. Since the Mac Jr is about the same size as a regular cheeseburger, I understand why there is no need for a box. 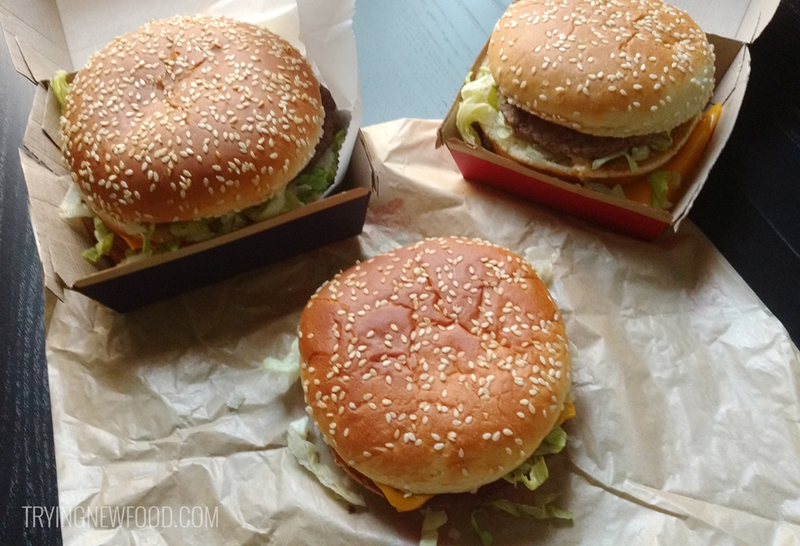 The Mac Jr is just a Big Mac with only one patty and no middle bread, while the Grand Mac had larger buns and patties compared to the Big Mac. The Mac Jr we got had a dried out bun, but overall everything tasted as expected. I love the options these three sizes provide. 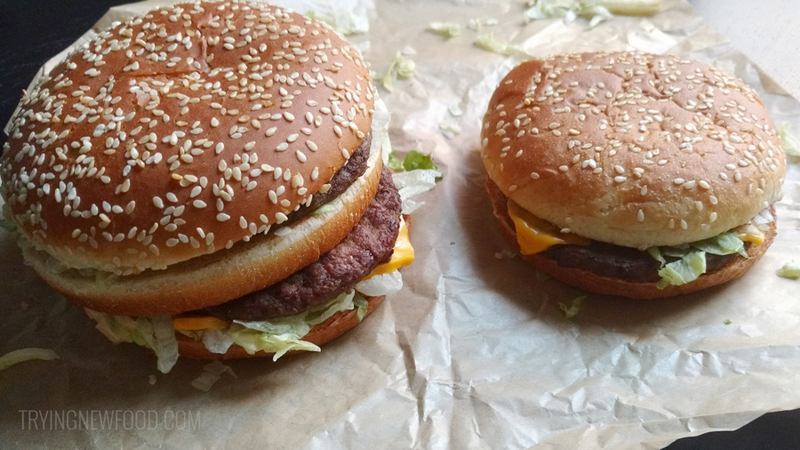 If I’m craving a Big Mac but want a little less, a Mac Jr is 460 calories vs. the Big Mac’s 540. The Grand Mac is 1,400 calories which worked out for my hungry husband who hadn’t eaten much all day and was ravenous.